The church: Church of the Apostles, Atlanta, Georgia, USA. The building: Absolutely gorgeous – and huge! The church is clearly visible from the road – no driving around aimlessly trying to find this one, for sure! The architecture is breathtaking, and the landscaping pretty and tasteful. The main sanctuary features a circular platform up front flanked by projection screens and backed by stained glass windows. The building sprawls out into various chapels, classrooms, child-care/nursery facilities, and probably much more than I was able to see. Best of all, there are clear directional signs everywhere inside the church. Despite the vast size of the building, it was easy to navigate and find where I needed to be, whether it was the restroom, the bookshop, or the main sanctuary. As the church is located in an urban business area, there was a large parking deck (no charge for parking, of course). The church: This church is huge. There are thousands of members and attendees. Yet, in spite of the massive amounts of people everywhere, not once did I feel out of place, lost, or unnoticed. It was a very friendly, welcoming church. Its numerous ministries are documented on their website. The church is also noted for its world-wide television and radio ministry, "Leading the Way." 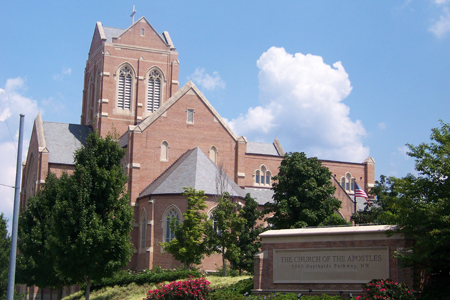 The neighborhood: Church of the Apostles is located in an affluent area of northwest Atlanta, on a very busy main road. The cast: The Revd Michael Amerhom Youssef, rector, conducted baptisms and preached the sermon. Other members of the fabulous worship team were not mentioned by name. The date & time: August 9, 2009, 10.30am. The main auditorium of the church, where I was seated, appeared to be almost completely full. Fortunately, I had arrived early enough to get a great seat in the fifth row – great view of everything, up close and personal! The balcony, which circled three sides of the auditorium, appeared to be not quite half full. The congregation were a very good mix of ages – very young, very old, in between – and races. Most people were dressed in their Sunday best (recall that the church is located in a fairly affluent area), while I wore my usual black jeans, Christian biker t-shirt, and comfortable (i.e., well-worn) biker boots. Yes! First, the people entering the building before me held the door for me and said good morning. Next, one of the church women greeted me and handed me a flyer advertising an upcoming event, inviting me to attend. As I meandered around the foyer, stopping at the various information tables, various people greeted me and were very helpful. Yes, the pews were padded and very comfortable. The only thing not-so-comfortable about the pews was that they were a bit too close together. Whenever anyone entered or left the pews, it was a bit of a squeeze for them to get by. Busy, upbeat, friendly. People were greeting friends, going to or from their various Bible study classes, etc. People were very outgoing and friendly, going out of their way to introduce themselves to others. Nearly everyone – members and visitors alike – wore name tags (available at the info desks). Good idea, I thought! I was enjoying myself so much, taking in the beauty of the sanctuary and chatting with my pew-mate Pat (who's been going to this church for a little over two years now), I forgot to write the down the opening words (oops, sorry). But they were something along the lines of "Welcome to the Church of the Apostles." The Holy Bible, New International Version (large print edition). No hymn books, as the words to the songs were put up on screens at the front of the church. Keyboards, violins, guitars, trombone, drums, and other instruments that I could not see from where I sat. The musicians appeared to be in a sort of mini-orchestra pit behind the altar, so I couldn't see all of them. The only thing that distracted me was, well, me! I kept looking around and trying to take in everything. The stained glass windows, each depicting a different scene or picture, were gorgeous. Despite my non-conformist attire, not once did I get any negative looks, nor did anyone avoid me or appear to be uncomfortable or unwilling to approach me. By the end of the service I had the strong and distinct impression that had I been wearing Gucci, or had I been a homeless person wearing rags, it would not have mattered to the people at this church. They were just glad I was there, regardless of how I dressed. And that is how it should be! Very upbeat! The worship was a fabulous blend of traditional hymns, a few modern contemporary Christian worship songs, and some classic praise choruses. Something for everyone, and very well done. Some people raised their hands and clapped in worship; some did not. This is a church where the happy-clappy and the more conservative, reserved folks could (and did!) worship side by side and feel right at home. 10  I have heard Dr Youssef preach before on the radio and on TV, but never in person. He came across as being very genuine, sincere, dedicated, and truly passionate about knowing and following Jesus, and leading others to know and follow him! He presented the gospel and biblical truths simply and unashamedly without coming across as a fire-and-brimstone guy. All in all, I found his sermon to be a solid, well-balanced challenge and encouragement to continue living a life of total obedience to Christ. The rector's text was Philippians 1:27-2:11 (be humble as Jesus was humble), Without unity of mind, home and church, it is impossible to have true joy. And without complete submission and obedience to God through a genuine and vital relationship with Jesus Christ, it is impossible to live in unity. Sin blocks our relationship with God and others and is the cause of strife and disunity. Sin keeps us from experiencing true joy. When sin is repented of, dealt with and forgiven, unity can again grow and joy will be restored. As followers of Jesus, we should have the same attitude that Jesus had when he walked this earth: an attitude of being a servant to others, humble, compassionate, merciful, and genuinely loving others. While Jesus was fully divine and had every right to lord it over his disciples, making them serve his every whim, he did not do so. Instead, he chose to limit himself to human form and all that entails, even dying on a cross, so that we might come into relationship with him. Most of it! I was pleased and even a tad surprised by how welcomed I felt there, from beginning to end. Probably the very best part of the whole experience, to me, was the worship. The music was beautiful and the songs were some of my favorites. I'd have to say the parking garage. Parking garages and I don't get along so well – I'm forever getting lost in them and end up driving in circles forever. On the upside, there were several Atlanta police officers directing traffic in and out, thus making my escape from the maze much easier. I felt so comfortable and at home, it was hard to look lost. I did hang around the lobby for five minutes following service, during which time several people said "hi" to me as they went by. But nobody stopped to chat, and I eventually took the bulletin's suggestion and asked at the information desk for directions to the coffee reception. Even so, I still did not feel left out. So many people had spoken to me and struck up conversations earlier that I didn't feel isolated in the least. Coffee was great, as was the mixed fresh fruit they had set out specifically for first-time visitors. I gathered my gift bag (which contained two CDs and a slew of information about the church and its ministries) and settled into a corner, to attempt to look lost and alone again. No such luck – several people came by and struck up conversations with me again. 10  From what I could tell, this appears to be a phenomenal, thriving, church. Everything was absolutely fabulous! Doctrinally sound, genuine, friendly, and with myriad ministries and Bible studies and classes to meet the needs of just about every demographic you can think of. I live some distance away and am happy with my own church, so I will not be making this my church home. But I would heartily recommend this church to anyone! And were I to move to Atlanta, Church of the Apostles would definitely be on my list of churches to learn more about. Yes, very much so. Glad, and challenged to continue a life of obedience and service! How welcoming everyone was and how accepted and part of the group I felt, in spite of the fact that this is a big, famous, TV church.